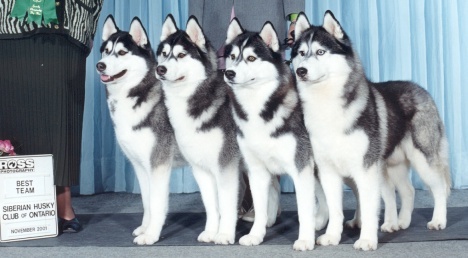 Bain's Northern Kennel Siberian Huskies - Breeder of Top Winning Champion Purebred Show Dogs, Sled Dogs and Pets. Bain's Northern Kennel has been producing Top Winning Show Dogs and Top Winning Sled Dogs for over 30 years. Many kennels around the world are based on Bain's Northern bloodlines. And just as many families are happy with their pet Siberian Husky. Bain's Northern Kennel has been recognized by the Canadian Kennel Club and Pedigree Dog Foods as Top Breeder for 1992, 1993, 1995, 1996, 1998, 2000, and 2001. BIS Ch Bain's Northern Red Mohogany - "Mohogany"
Am/Can Ch Innisfree Virginia G'ntleman CD - "Boss Hogg"
Ch Bain's Northern Top Hat'N'Tails CD SD - "Bogart"
Multi BIS, Multi BISS Am/Can Ch Bain Northern Stebben Starbuck SD - "Stebbens"
Multi BIS Am/Can Ch Bain's Northern Kissing A Fool - "Oliver"
Am/Can Ch Kontoki's The Minstrel SD - "Oscar"
Ch Bain's Northern StrayCat Strut SD - "Strut"
Multi BISS Spain/Am/Can Ch Bain's Northern Hopes Are High - "Carsen"
BISS Am/Can Ch Bain's Northern Look Both Ways - "HedgeHog"
NZ/Am/Can Ch Bain's Northern Anydreamwilldo - "Andi"
Breeder of over 100 championship titles, many obedience titles, and numerous sleddog titles.